What a fascinating site! I've just spent a lot more time than I can afford taking a look at it. I wonder if you would consider including some information about Strathpeffer Pavilion in the Highlands of Scotland, and perhaps a link to our website as below. The Pavilion started life as a place of entertainment for the wealthy visitors who came to "take the waters" in Victorian times, in what was then the most northerly spa in Europe. 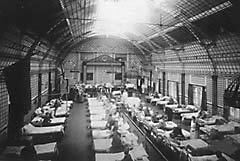 The building has since gone through several incarnations - including being used as a US Naval Hospital during the first World War (see attached photo). It then became a ballroom and restaurant and a popular place for weddings and other functions. In the 1960s, it was acquired and refurbished by Highland Lass Estates, which ran it as a dance hall at weekends and a venue for a "Highland Cabaret" during the week. Many hundreds of people, now scattered all over the world, have fond memories of dances in the Spa Pavilion. Indeed, a member of our staff who was on holiday in the States told us that he got chatting to a chap in a launderette in a small town in the California desert and it turned out that the chap was a musician, who used to perform at dances in the Pavilion! In the last decades of last century, the Pavilion changed hands and was allowed to fall into disrepair, which was a very sad sight for all who know and love Strathpeffer and the Pavilion itself. However, in 1996, it was acquired by the Scottish Historic Buildings Trust, which managed to raise the funds necessary to restore the building. The Pavilion re-opened in 2004 and is now being run by a voluntary local charitable organisation, Strathpeffer Pavilion Association (SPA). At the same time as trying to establish the Pavilion as an exciting new venue for the arts, functions (including weddings), dances and other events, SPA is raising money to complete the job of buying the necessary furniture and equipment so that this grand old building can fulfill the vision that we have for its future. For our very first functions in 2004, we did have tables but we had to hire chairs and borrow crockery and cutlery. We also had to borrow a stage for more than a year! As you can perhaps see from our website, we have come a very long way since then, but we still have a long way to go.